C++ has indeed become too "expert friendly" -- Bjarne Stroustrup, The Problem with Programming, Technology Review, Nov 2006. Stroustrup's saying is true because experts are intimately familiar with the idioms in the language. With the increase in the idioms a programmer understands, the language becomes friendlier to him or her. The objective of this open content book is to present modern C++ idioms to programmers who have moderate level of familiarity with C++, and help elevate their knowledge so that C++ feels much friendlier to them. 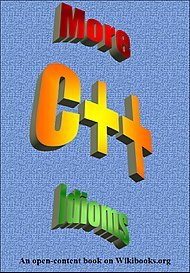 It is designed to be an exhaustive catalog of reusable idioms that expert C++ programmers often use while programming or designing using C++. This is an effort to capture their techniques and vocabulary into a single work. This book describes the idioms in a regular format: Name-Intent-Motivation-Solution-References, which is succinct and helps speed learning. By their nature, idioms tend to have appeared in the C++ community and in published work many times. An effort has been made to refer to the original source(s) where possible; if you find a reference incomplete or incorrect, please feel free to suggest or make improvements. The world is invited to catalog reusable pieces of C++ knowledge (similar to the book on design patterns by GoF). The goal here is to first build an exhaustive catalog of modern C++ idioms and later evolve it into an idiom language, just like a pattern language. Finally, the contents of this book can be redistributed under the terms of the GNU Free Documentation License. This book requires C++ as a corequisite. Note: synonyms for each idiom are listed in parentheses. These are some more advanced C++ idioms. This page was last edited on 12 September 2018, at 22:09.